John Aguiar is seen reading his poetry at the Writers Meet organized by Institute Menezes Braganza at Keri, Sattari on March 18, 2012. Also seen are President of Gomantak Marathi Akademi Shri Narendara Azgaonkar, Vice President of Institute Menezes Braganza Shri Mohandas Surlakar President of Goa Konkani Akademi Shri Dilip Borkar, Shri Rajendra Kerkar and Shri Ashok Parab. 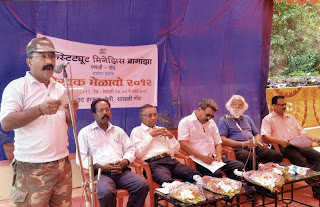 Literature plays a very important role in preserving nature and therefore there is need for Goan writers to make awareness on environment and nature said Mr. Narendra Azgaonkar, President of Gomantak Marathi Akademi. 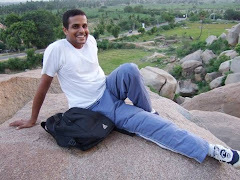 He was speaking at the one-day writers meet for Goan writers organized by the Institute Menezes Braganza at Keri village in the lap of nature on March 18, 2012. 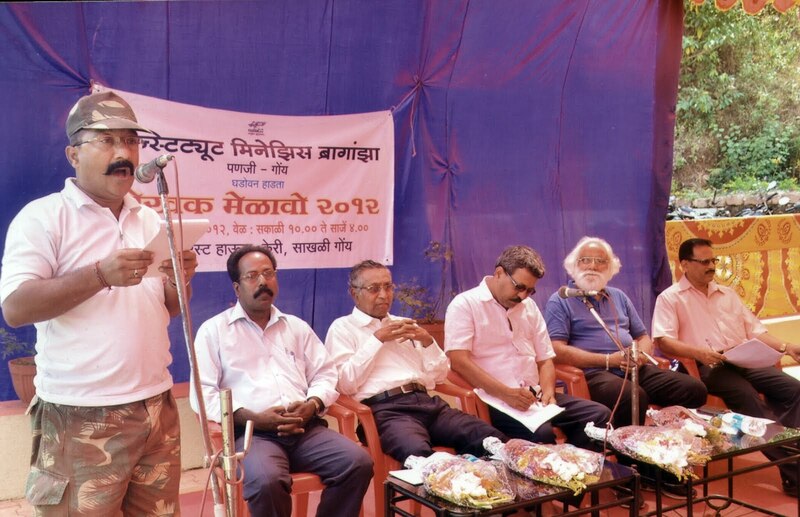 Environmentalist and writer Shri Rajendra Kerkar presided over the meet. Speaking on the occasion Shri Karkar said that great responsibility lies in the writers in preserving nature and there is time that they should show the might of the pen. President of Goa Konkani Akademi said that Nature bring gentleness. Literature grows and blooms in the lap of nature and therefore it is the bounden duty of the writers to preserve and protect nature. Shri Mohandas Surlakar, Vice President of Institute Menezes Braganza expressed happiness about the good response from the writers for the one day meet. The writers and poets attending the meet through their poems and literature expressed concern about the degradation of nature in the state in the name of development, the common concern being that jungles are being cut, trees felled to construct concrete jungles, while water bodies and rivers were being polluted. 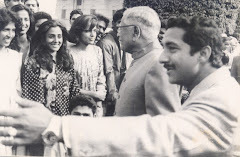 The writers felt that they were the eyes of the society and therefore could create awareness on these issues. Shri Uday Mahambre in his poem “Ganv” highlighted the woes of the village. Sanjeev Verekar ‘s poem ‘Mor’ was well appreciated and applauded, Gazal by Radha Bhava , Nayna Adarkar in her poem ‘Ithas Zama’ said that the nature and the natural beauty are becoming the thing of the past, John Aguiar in his poetry “Kupam” expressed concern about the nature, Shri Laximan Pitre regaled the poetry lovers, Mahableshwar Sail highlighted the strong bond between the literature and nature, Kashmiri Pawaskar narrated nuisance of plastic bags, Maghana Kuruvadkar recited a beautiful poem on rain. 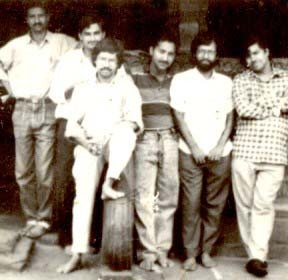 The writers who participated were Avdoot Kudtarkar, Maghana Kuruvadkar, John Aguiar, Aparna Garudi, Laximan Bandekar, Sanjeev Verekar, Arun Nayak, Shoba Fulkar, Sangam Bhosle, Jyoti Kunkolienkar, Sarojani Gaonkar, Rupa, Kosambe, Radha Bhave, Chandrakant Gawas, Sujata Bhatkar, N. D. Borkar, Rekha Paudwal, Mahableshwar Sail, Dr. Pandurang, Sunil Palkar, Laximan Pitre, Daya Mitragotri, Manish Zore, Avinash Jadhav, Nayana Adarkar, Kalika Bapat, Uday Mahambre, Pournima Kerkar, Kashmiri Pawaskar, Smitha Kamat Bhandare and others. Prof Rajendra Kerkar was the moderator. The Member Secretary of IMB, Mr Ashok Parab, introduced the moderators and explained the aim behind such a meet. The vice chairman of IMB, Mr Mohandas Surlakar welcomed the gathering. Mr A. K. Lotlikar programme officer of Institute Menezes Braganza was also present.